In a ceremony held in Dover’s Old State House on March 8, 2018, Gov. John Carney signed into law the Abandoned Cultural Property Act, which allows Delaware museums to establish title to property that has been donated or left with them after a loan period has terminated and the lender could not be found. The law allows more efficient use of museum funds and assists museums in conserving, displaying and, when necessary, ethically disposing of abandoned, unclaimed or unsolicited property. Among those speaking at the ceremony were state Rep. Jeffrey Spiegelman, the bill’s primary sponsor; and state senators Nicole Poore and Ernesto Lopez and state Rep. Paul Bombach who also served as sponsors of the legislation. Additional speakers included Division of Historical and Cultural Affairs Director Tim Slavin; Dan Citron, executive director of the New Castle Historical Society and president of the Delaware Museum Association; and Dr. Kasey Grier, director of the Museum Studies Program at the University of Delaware and two students from the program—Sara McNamara and Kathryn Lenart. The issue of what to do with abandoned cultural property had long been discussed by members of the Delaware Museum Association. According to Citron, “Legislation to fix the problem has been on our wish list for some time, but we knew that the process of researching other states’ legislation and then drafting something would be time-consuming.” During such discussions, Grier and Suzanne Savery, deputy director of the Division of Historical and Cultural Affairs, came up with the idea of asking graduate students in the Museum Studies Program to take on the research project. Using the signing ceremony as a vehicle to honor the six student-researchers, Citron announced that they had been awarded the Delaware Museum Association’s Delaware Diamond Award for their efforts. The Delaware Division of Historical and Cultural Affairs is planning capital improvements at the Academy building, a state-owned historic property that the agency administers in downtown New Castle, Del. Improvements, which will begin in the spring of 2018, include replacement of the building’s existing wood-shingle roof with a new wood-shingle roof; replacement of existing roof hatches and flashing; and installation of an elastomeric coating on a metal section of the roof. The Delaware Division of Historical and Cultural Affairs notes, with sadness, the passing of John R. Kern who served as the division’s director and state historic preservation officer between 1984 and 1988. Among his many accomplishments with the agency, Kern oversaw major restoration work at the John Dickinson Plantation. Originally from Iowa, Kern received his bachelor’s degree from Swarthmore College and served two years in the Peace Corps in Tunisia before earning his master’s and doctoral degrees from the University of Wisconsin-Madison. Prior to coming to Delaware, he worked in a variety of history- and historic-preservation-related positions in Michigan. After leaving the division in 1989, Kern moved to Roanoke, Va. to become the regional director of Virginia’s Department of Historic Resources. After his retirement in 2010, he remained deeply involved in helping to preserve the historical legacy of southwest Virginia until his death on March 18, 2018. Go to the following for more information on the life and career of John R. Kern. During the month of April 2018, the Delaware Division of Historical and Cultural Affairs will be sponsoring 16 special programs at sites across the state. A full schedule is included below. Except where noted, all programs are free and open to the public. “Landing of the DeVries Colony at Swaanendael, Lewes, Delaware 1631” by Stanley M. Arthurs. Courtesy of the permanent collection of the University of Delaware. The Zwaanendael Museum will explore Delaware’s Dutch heritage in programs on April 21 and 28, 2018. “Let the Music Play: Inventions From Eldridge Reeves Johnson.” Program explores the many inventions of the Delaware native and founder of the Victor Talking Machine Company. Part one of the four-part “Coffee-Hour Lecture Series: ‘Delaware’s Inventors and Scientific Contributors.’ ” The Old State House, 25 The Green, Dover. 5:30 p.m. 302-744-5054. Lewes Tulip Celebration. City-wide series of events including tours, displays, children’s activities, crafts and more. Sponsored by the Lewes Chamber of Commerce. Downtown Lewes locations including the Zwaanendael Museum, 102 Kings Highway, which will feature tulip arrangements by the Sussex Gardeners and will be open Tue.–Sat., 10 a.m.–4:30 p.m. and Sun., 1:30–4:30 p.m. with free admission. Fees may be charged at other venues. 302-645-8073. “Prohibition in the First State.” Guided tours highlight the prohibition of alcohol in Delaware including an examination of the ratification of the 18th Amendment, its enforcement, its impacts on Delawareans and its eventual repeal through the ratification of the 21st Amendment. First Saturday in the First State program. The Old State House, 25 The Green, Dover. 9 a.m.–4:30 p.m. 302-744-5054. “Songwriting: Poetry Through Music.” In celebration of National Poetry Month, guided tours will highlight the great songwriters of the Victor Talking Machine Company accompanied by recordings of their compositions played on authentic Victor Talking Machines. First Saturday in the First State program. Johnson Victrola Museum, 375 S. New St., Dover. 9 a.m.–4:30 p.m. 302-739-3262. Buena Vista’s First Annual Spring Open House. Guided tours of the grounds of one of Delaware’s most historic estates at 10:30 a.m. and 12:30 p.m. Self-guided tours of the mansion and grounds are welcome. Buena Vista: A Delaware Country Estate, 661 S. Dupont Highway (Route 13), New Castle. 10 a.m.–1 p.m. 302.323.4430. Rededication of the Johnson Victrola Museum. Join the museum’s directors and staff in celebration of its 50th anniversary and the re-dedication of 50 more years of service to the community. Activities will also include a theatrical presentation by museum-interpreter Steven Mumford and musical selections by Don-Del Productions. Cupcakes and coffee will be served. Johnson Victrola Museum, 375 S. New St., Dover. Program at 11 a.m. in the museum’s 2nd floor gallery (entry via staircase; no elevator). Museum open 9 a.m.–4:30 p.m. 302-739-3262. “Nylon: A Success in Seaford.” Maria Heyssel of the Seaford Historical Society will examine the nylon manufacturing that took place in Seaford, Del. and the impact that it had on the local community and the world. Part two of the four-part “Coffee-Hour Lecture Series: ‘Delaware’s Inventors and Scientific Contributors.’ ” The Old State House, 25 The Green, Dover. 5:30 p.m. 302-744-5054. “ILC and the Space Suit.” Bill Ayrey, lab manager and company historian from ILC Dover, will discuss the development and usage of the space suit including those that the company manufactures for NASA. Part three of the four-part “Coffee-Hour Lecture Series: ‘Delaware’s Inventors and Scientific Contributors.’ ” The Old State House, 25 The Green, Dover. 5:30 p.m. 302-744-5054. Earth Day at the John Dickinson Plantation. Celebrate Earth Day with a hike on the estate of the “Penman of the Revolution” followed by a potpourri-making demonstration. Dress appropriately. John Dickinson Plantation, 340 Kitts Hummock Road, Dover. Hike at 11:30 a.m. Museum open 10 a.m.–4:30 p.m. Free admission but, due to space restrictions, reservations for the hike are required by calling 302-739-3277 no later than April 20. 302-739-3277. “Mysteries at the Museum: ‘Blood Diamond: The Murder of Ebe Lynch.’ ” It is 1916, on a hot summer night on Second Street in downtown Lewes, Del. and a shot has been fired. Ebe Lynch is dead! In this historical play, museum guests will search for clues to help solve the mystery and find the killer. Zwaanendael Museum, 102 Kings Highway, Lewes. Program at 2 p.m. on the museum’s 2nd floor (entry via staircase; no elevator). Museum open 10 a.m.–4:30 p.m. Free admission but, due to space restrictions, reservations for the lecture are required by calling 302-645-1148 no later than April 20, 2018. “Festival at the Fort.” Event explores Wilmington’s Colonial-era cultures of the Lenni Lenape, Swedes, Finns, Dutch and English. Activities include children’s games, crafts and vendors, ceremonies, live music, tours of the Kalmar Nyckel and Old Swedes Historic Site, a scavenger hunt, food trucks and more. Seventh Street peninsula in Wilmington including Fort Christina National Historic Landmark, 1110 E. Seventh St. Noon–4 p.m. General admission free with fees charged for some activities. 302-429-7447. “Doctor James Tilton and the Tilton Hut.” Historic-site interpreter Dennis Fisher will discuss how this life-saving invention, developed by Dr. James Tilton of Kent County, Del., was created in the 1700s. Final segment of the four-part “Coffee-Hour Lecture Series: ‘Delaware’s Inventors and Scientific Contributors.’ ” The Old State House, 25 The Green, Dover. 5:30 p.m. 302-744-5054. State Sen. Nicole Poore recently visited the New Castle Court House Museum, located at 211 Delaware St. in New Castle, to celebrate the accreditation of the museum system of the State of Delaware by the American Alliance of Museums, the highest recognition afforded to museums in the United States. Administered by the Division of Historical and Cultural Affairs, the system includes five state museums, over 40 historic properties and the state’s archaeological and historic-objects collections. Delaware Division of Historical and Cultural Affairs Deputy Director Suzanne Savery and site supervisor Nena Todd of the division’s downtown Dover museums recently gave a presentation to the commissioners of the Kent County Levy Court celebrating the accreditation of the museum system of the State of Delaware by the American Alliance of Museums, the highest recognition afforded to museums in the United States. Administered by the Division of Historical and Cultural Affairs, the museum system includes five state museums—the John Dickinson Plantation near Kitts Hummock; the Johnson Victrola Museum and Old State House in downtown Dover; the New Castle Court House Museum; and the Zwaanendael Museum in Lewes—over 40 historic properties and the state’s archaeological and historic-objects collections. Go to the following for a comprehensive, long-term calendar of division-sponsored events. State Rep. Richard G. Collins recently visited Prince George’s Chapel, located at 32040 Ward Lane in Dagsboro, Del., to celebrate the accreditation of the museum system of the State of Delaware by the American Alliance of Museums, the highest recognition afforded to museums in the United States. Administered by the Division of Historical and Cultural Affairs, the system includes five state museums, over 40 historic properties and the state’s archaeological and historic-objects collections. On March 12, 2018, the Delaware State Historic Preservation Office released a report on some of the most significant accomplishments that it has achieved during the past year. A unit of the state’s Division of Historical and Cultural Affairs, the office administers a broad range of federal and state programs that identify, register and help to preserve Delaware’s historic places and unique cultural identity. The Delaware Division of Historical and Cultural Affairs is currently seeking qualified applicants for the part-time position of Physical Plant Maintenance/Trades Mechanic I. The position is responsible for completing basic repairs in several trade fields and performing routine preventative maintenance and repair work at the semi-skilled level. Applications are available by going to the Delaware Employment Link. Application opening date: March 8, 2018. Closing date: March 14, 2018. 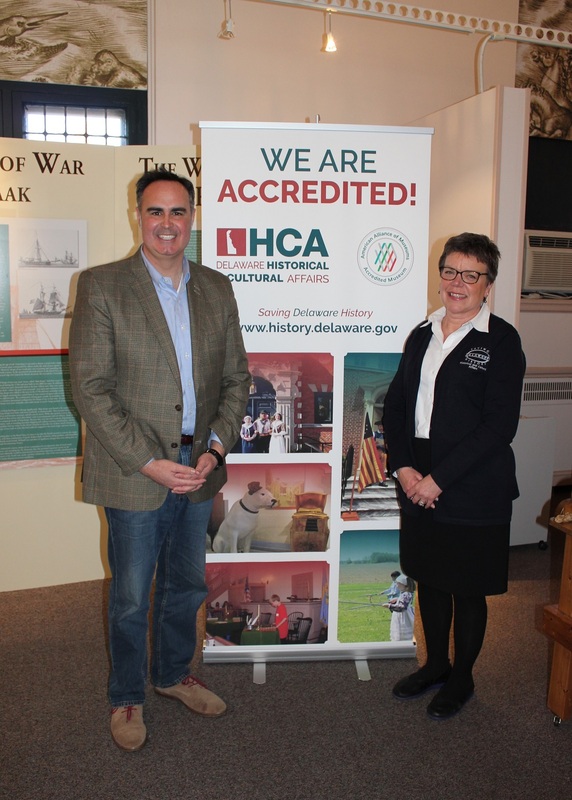 State Sen. Ernesto Lopez recently visited the Zwaanendael Museum, located at 102 Kings Highway in Lewes, Del., to celebrate the accreditation of the museum system of the State of Delaware by the American Alliance of Museums, the highest recognition afforded to museums in the United States. Administered by the Division of Historical and Cultural Affairs, the system includes five state museums—the John Dickinson Plantation near Kitts Hummock; the Johnson Victrola Museum and Old State House in downtown Dover; the New Castle Court House Museum; and the Zwaanendael Museum in Lewes—over 40 historic properties and the state’s archaeological and historic-objects collections. State Sen. Ernesto Lopez visits the Zwaanendael Museum in celebration of the Division of Historical and Cultural Affairs’ accreditation by the American Alliance of Museums. With Lopez is Zwaanendael Museum site supervisor Bridget Warner. The museum is currently open for visitation and tours from Wednesday to Saturday, 10 a.m. to 4:30 p.m. Admission is free and open to the public. Go to the following for a comprehensive, long-term calendar of division-sponsored events. For additional information, call 302-645-1148.